#1 How to Do First Aid on a Baby? Practicing adequate first aid can be hard enough. But, performing first aid on a baby can be even harder because babies are still developing and are more sensitive than adults. In addition to being smaller and more fragile than adults, babies are more likely to get injured because of their curiosity and willingness to try anything. That being said, it’s important for parents to learn proper first aid techniques. So, here are ten phenomenal first aid techniques that could potentially save a baby’s life! First and foremost, every parent should own a first aid kit. You never know when or where your baby could get injured, and it’s better to be safe than sorry. So, keep at least one first aid kit in your house. It’s also important to note that your first aid kits should have baby friendly items. In other words, make sure your first aid kit includes some soap, medicine, and other products that your baby will be able to use. Your baby could stop breathing for a variety of reasons. While this is an extremely scary situation, it could potentially be solved with CPR. Since CPR is an advanced medical practice, only people who are certified should perform it. Therefore, don’t stress about knowing someone who is CPR certified. Instead, take the initiative yourself and get certified. Medical practitioners typically hold CPR certification classes at community centers. While this is typically practiced in CPR class, it’s important for everyone to know how to stop an infant from choking, regardless if they’re CPR certified or not. Stopping an infant from choking only takes a few simple steps. As soon as you identify a choking infant, lay the infant on their stomach and firmly slap them on the middle of their back five times. Then, turn the infant on their back, place your pointer and middle fingers in the center of their chest, and thrust five times. Continue this process until the baby stops choking. Unfortunately, this process might not stop the baby from choking. In fact, the baby could potentially become limp. In the case this happens, CPR should be administered. Before getting into how you should care for burns, it’s important to note that regardless of the size or severity of a burn, your infant should be examined by a medical professional. Now, there are two different processes for burns. If your baby experiences a minor burn, simply place the affected area in cold water. Leave the water running for approximately ten minutes. Then, seek medical attention. In the event your baby suffers from an extremely large or critical burn, you should call 911 immediately. Do not place the burn under cool water or attempt to remove any remains of clothing. Instead, leave the care strictly to the professionals. 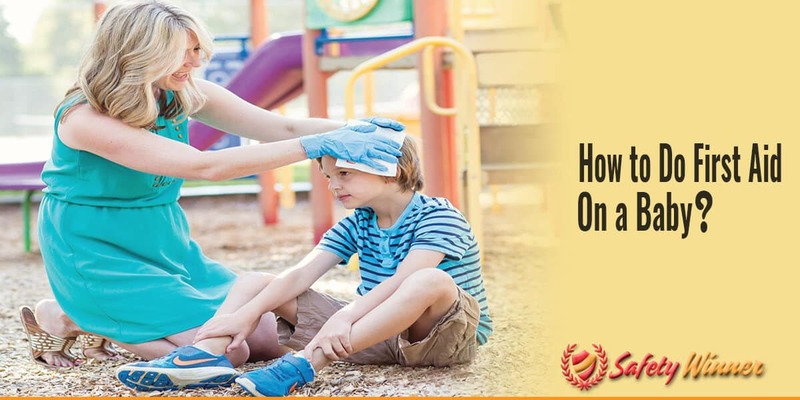 If you want to be safe, seek medical attention regardless of the severity of the head injury. Other than seeking medical attention, there is nothing you can really do to treat a head injury yourself because babies cannot respond like adults. Therefore, leaving an evaluation to a medical professional is your best bet. While you cannot necessarily take care of a baby’s head injury, it’s important to stay and monitor the injured baby until help arrives. Most children experience a nosebleed at least once in their lives. Most nosebleeds are easily treatable. If your baby experiences a nosebleed, simply place your fingers at the bottom part of the baby’s nose, on either side of their nostrils, and gently pinch. Keep your fingers pinched for approximately ten minutes. After the ten minute mark, the bleeding should stop and your baby should be fine. In the event that the blood does not stop, you should seek medical attention immediately. Like head injuries, if your baby experiences a fever, they should see a medical professional. Although fevers are serious problems, you can typically wait to see your pediatrician for care. In the event your baby experiences any of these symptoms, simply make sure they’re wearing a minimal amount of clothes that will keep them cool. Then, use a thermometer to check their temperature. Of course, if their temperature is abnormally high, even for a fever, do not wait to see your pediatrician. Instead, seek medical help immediately. Sometimes, minor wounds happen. Typically, minor wounds can be cared for at home without seeking medical attention. Of course, if the wound is large, severe, or does not get better in a timely manner, then you should seek medical attention. In order to care for a wound, start by washing your hands. If you really want to take an extra step of precaution, put on sterile gloves. Once you adequately dry and sterilize your hands, use water to gently clean the wound and surrounding area. Then, blot dry it and place ointment on the affected area. The ointment will speed up the healing process, sterilize it, and help prevent further infections or complications. Finally, take a band aid or bandage, cover the wound, and secure it. Make sure to check on the wound, clean it, and change the bandage every day. While insect bites are usually not harmful or detrimental to a baby’s health, they can easily annoy and aggravate your baby. If your baby is bitten by an insect, such as a mosquito, use a cold compress to reduce the pain, warmth, and swelling of the bite. Ice cubes also work. If you don’t know what kind of insect bit your baby, the reaction seems to be severe, or the bites aren’t going away, seek medical attention as soon as possible. While accidents and injuries aren’t always preventable, the risk of a baby getting injured is significantly reduced when a parent stays with a baby at all times. In other words, never leave your baby by themselves. If you ever feel too busy or have an obligation where your baby cannot be with you, such as in a professional setting, you should make sure your baby is being watched by someone responsible and trustworthy. After all, an accident and injury could occur within the blink of an eye. So, make sure your baby has someone watching over them at all times.